You are currently browsing the archives for the Cat Beds category. Prissy little balls of fur, cats are creatures of habit. Whatever nook in your home they choose as their stomping grounds, you can bet they’ll try to claim the territory as their own, just like astronauts on the moon. Therefore, it’s better to create a cat-friendly zone in your roost beforehand to draw them in. Fill it with toys, snacks, and a comfy space to lounge, they’ll have checked in to their own world in no time. Instead of using blankets and pillows, that you might need later, as their source of comfort, choose from one of the many styles of cat beds. 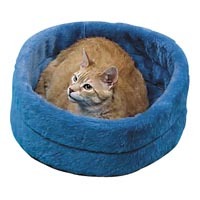 Round or square, large or tiny, you’ll find a cozy option that works best for your cat. Your feline will be much happier and well-rested with your new purchase. And having a cat that’s happy will make your life a lot more enjoyable.